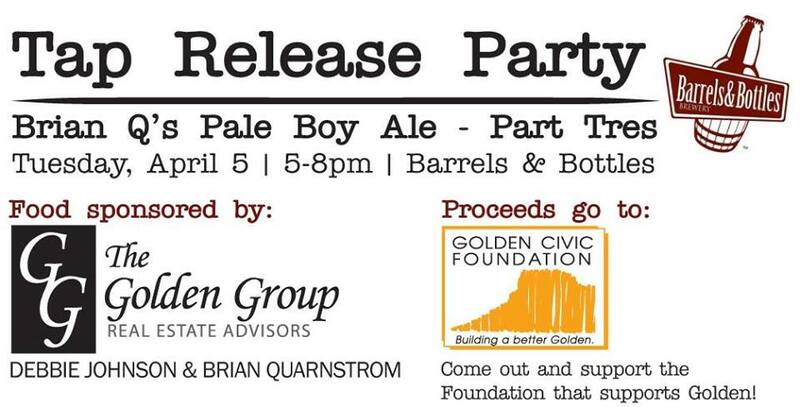 Tap Release Party – Brian Q’s Pale Boy Ale Part Tres! For the third year in a row, Brian Quarnstrom (aka “Q”) has has brewed a beer with the awesome owners of Barrels and Bottles, Zach and Abby. Please join us as we taste the third ever “Brian Q’s Pale Boy Ale – Part Tres”! For every beer/wine purchased during this event, $1 will be generously donated by Barrels & Bottles to the Golden Civic Foundation. Come out and support the Foundation that supports Golden!